PUT MOTHER NATURE BACK IN YOUR FACE FOR THE COST OF A FACIAL! Would you like to take years off your face? Turn back the hands of time? ELR combines mircocurrent with therapeutic light and color to provide a one of a kind rejuvenation treatment that encourages collagen production, smooth fine lines, lifts wrinkles, firms skin, tones, improves skin texture, color, diminishes blemishes, breakouts and minimizes puffiness. ELR is for you! Treatment is 1 hour per week for 10 weeks. The up-keep is then 1 treatment every 6 – 8 weeks! schedule for other time options. After 10 treatments! 1 treatment per week cost $120 each treatment. Upkeep is 1 treatment every 6 to 8 weeks. 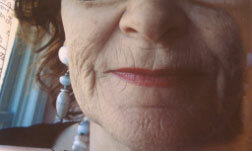 Client S. age 50, let us do 1/2 her face for 3 treatments. NOTICE; we worked around the LEFT eye. The LEFT eye lid and eyebrow is lifted higher than the untreated eye on the RIGHT. The corner of the eye on the LEFT is also lifted up and is higher than the corner of the eye on the RIGHT. Also the eye on the LEFT has no dark circle under it like the untreated eye on the RIGHT. Client S. age 50, bottom 1/2 of face done with 3 treatments on the RIGHT SIDE. The RIGHT side lips are lifted upward along with her RIGHT cheek. 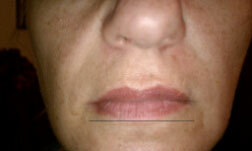 NOTICE the RIGHT line from nose to mouth is almost gone, whereas the LEFT side is sagging, puffy and lower. BOOK YOUR FACIAL AND SEE WHAT WE CAN DO FOR YOU! Â follow us on facebook for health & wellness tips! What Makes ELR different from other facial rejuvenation treatments? Everything! Energy Light Rejuvenation stimulates the regeneration of healthy skin tissue by working in harmony with the natural process of the body. ELR is holistic and high-tech. The rejuvenation process of ELR has no negative side effects-no swelling, redness, numbness or flaking. We only offer the side benefit of feeling as great as you look! What is Microcurrent and is it safe? Microcurrent s also known as electro-medicine and has been used safely and effectively for decades by medical professionals, including chiropractors, physical therapists, MD and ND to treat conditions such as deep tissue injuries. Through these applications the cosmetic benefits of Microcurrent where discovered. Microcurrent is safe and non-invasive and works in harmony with the natural energy system of the body. Unlike other non-invasive facial treatments, Microcurrent causes no discomfort, swelling or redness. What is Therapeutic Light & Color? Therapeutic Light and Color is what sets ELR apart from other electro-facial treatments. Light and color have a remarkable healing effects on the body. by combining specially selected colored light to the correct acu-points of the body, we are able to address and specific needs of each individual client. 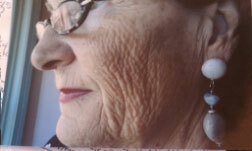 The combination of Microcurrent and color light therapy provides positive and lasting results. How many ELR sessions are required? Each person is different, and your skincare or wellness professional will assess your unique needs. Generally speaking, 10-20 treatments are recommended. However, you will notice a difference in the way you look and feel after the first treatment. by the third session, friends and family will notice. More dramatic results are seen around treatment 10. Since there is no downtime required for healing, treatments can be performed consecutively under the direction of your skincare or wellness professional.